The Victory MMA and Fitness Children’s Program boasts incredible world class instructors and 9 Kid’s classes a week to chose from. Whether it be the quality of the instructors, the positive impact on the kids, or even the cost, this program is unmatched. With the addition of six time world champion Leticia Ribeiro to our staff, we have an unmatched world class Kid’s instructor team. The 4 member instructor team also includes UFC Coach Jocko, Boxing expert Tony Palofox, and UFC Veteran Shannon Gugerty. They are passionate about the skills they teach, and love instructing kids. Often Kids are limited to certain classes, and only two or three classes each week. 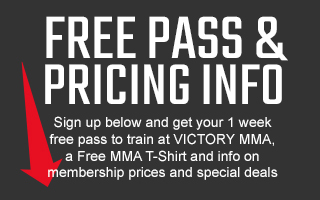 At Victory, the Kids can attend striking classes, Jiu Jitsu classes, and/or grappling classes. They can also attend as many classes as they want. We have nine kid’s classes each week. Kids 4 and up can now learn discipline, respect, and valuable life skills in a safe, affordable and fun environment. Our world class instructors will guide them every step of the way, building their self esteem and preparing them for the challenges of life.